12 Black Friday Travel Deals in Singapore You Wouldn't Want to Miss! Klook’s Black Friday & Cyber Monday Sale is one of the  best travel promotions. Enjoy 10% off ALL activities (capped at $27). It’s fantastic because (as you know) Klook offers discounted travel activities, F&B and transfer services. Now you enjoy additional 10% off the discounted prices. That’s not all! After you make a booking and enjoy 10% off, you’ll receive a code for 50% F&B activities. There are also various Buy 2 Get 2 Deals happening during this period. * Promo code SGBLACKFRI will only be live on 23th November 2018, 12am. One of my favourite travel agencies, Chan Brothers, is offering 1-for-1 special deals for cruise departing from Singapore this year end school holiday. My eyes widened at the sight of 1-for-1 and school holiday, hahah! This promotion is posted on their Facebook Page. For details, you have to PM them to find out. * Terms & Conditions Apply, Limited cabins available, while stocks lasts! Save up to 50% off Hotels in Japan, South Korea, Thailand and Maldives when you book between 20 to 23 November 2018. This offer is subjected to availability at all properties in Japan and Korea, as well as selected properties in Thailand and Maldives. The 50% off sale is available for Hilton Honors members only – it’s free to join! Rooms must be booked by 1pm SGT on 23 November, and stays must be between 20 November 2018 and 28 March 2019. Good thing is – the March school holiday is included. Now, let me go plan for my March holiday first. Just a reminder that these rates are non-refundable, hence be sure to confirm your trip before you make a booking. 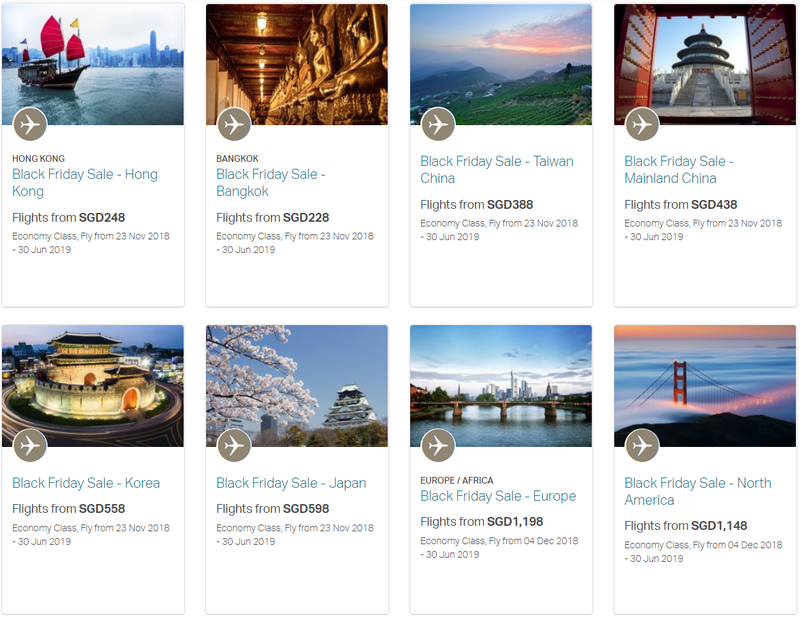 Enjoy Cathay Pacific’s Black Friday sale – special Economy Class fares starting from $228 all-in return to over 50 destinations. Book by 25 Nov 2018. Book your Europe flight now with Finnair’s Black Friday offers! BLACK FRIDAY DEAL from the family resort “Rawai VIP Villas” & “Rawai Park” on Phuket! Follow the link on their Facebook Page for 50% discount. Conditions apply. 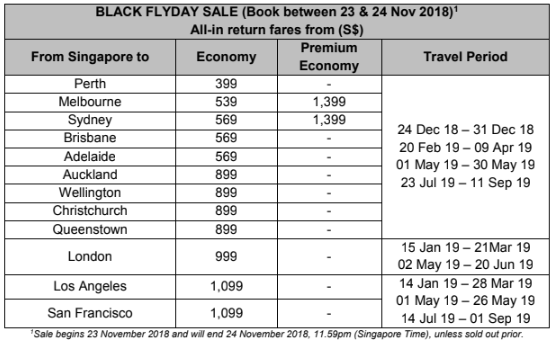 Qantas is having its Black FLYDay Sale offering Economy and Premium Economy fares from S$399 and S$1,399 (return all-in fares) on 23-24 November 2018. Fly from Singapore to Melbourne and Sydney for just S$539 and S$569 respectively in Economy. Other exciting destinations include London, Los Angeles and San Francisco where Economy fares start from just S$999 with travel period up to 1 September 2019. 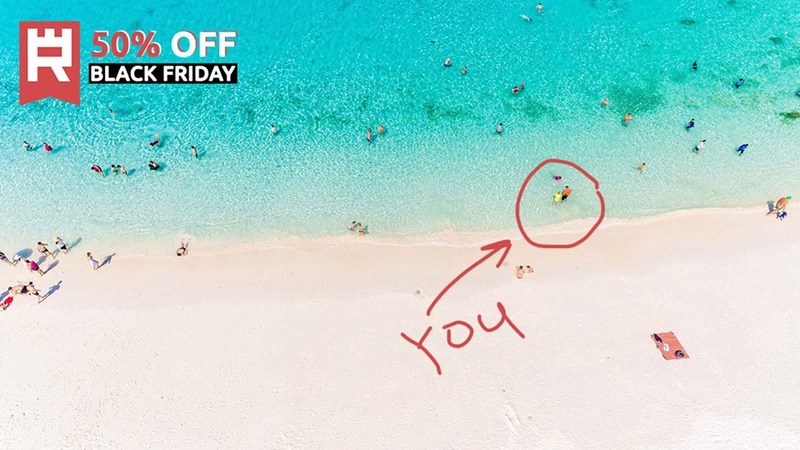 My favourite hotel chain in the world, AccorHotels, is celebrating Black Friday with up to 50% savings across all participating AccorHotels properties! Book between 22 to 26 November 2018 for stays between 1 January 2019 to 24 February 2019 and enjoy up to 50% off for Accor Plus members (40% for non-members) room rates. Discounted stays cannot be cancelled or refunded – so be sure to firm up your travel plan before booking them. Book a stay at one of the 12 hotels across Asia and get 25% off the flexible rate. Additionally, My Millennium members get an extra 5% off. Book by 27 November 2018 and stay by 31 March 2019. Participating hotels include Copthorne Kings Hotel Singapore, M Hotel Singapore, Copthorne Hotel Cameron Highlands, Millennium Resort Patong Phuket and more. Trip.com is having a Black Friday Sale on 23 November 2018. One day only! Save 10% on hotels worldwide when you booking using Trip.com mobile app using promo code SGBLK10. Vietnam Airlines is offering special deal for Black Friday 2018: 15% off on airfares (one way and round trip) for Vietnam Airlines operated flights with promotion code. Key in the promo code above to enjoy discounts up to S$100 per person for selected tours to Europe and Asia. Last but not least, I’m currently running an Instagram giveaway. WIN a complimentary access to Plaza Premium Lounge at Singapore Changi Airport for 2 pax. Hop over to my Instagram @ourlittlesmarties to participate. Disclosure: This post contains affiliate links. We may receive a small commission when you click on them and make a booking (at no extra cost to you).